The ANC has been criticised for the way the matter was handled, and President Jacob Zuma is expected to face tough questions at the closed-door meeting. Lonmin, the world's third largest platinum producer, had hoped that the strike at the Marikana platinum mine would end and production would resume. "Employees are waiting for the environment to be safe. 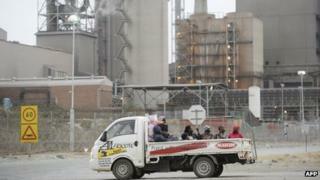 Groups of people are walking around intimidating people who come onto the property," Lonmin spokeswoman Sue Vey told the BBC. Alfonso Mofokeng, a miner from Lesotho, told the AFP news agency: "We are aware that some people have gone back to work, we have noted that behaviour, and we need to come up with a plan to deal with them." Operations at Lonmin's mines have virtually ground to a halt since the strike over pay and conditions began earlier this month, causing international platinum prices to jump. Meanwhile, an investigation has opened into allegations that miners were assaulted in police custody, a spokesman for the Independent Police Investigative Directorate has confirmed to the BBC. President Zuma is expected to face an uneasy time when he meets the ANC's National Executive Committee, the BBC's Karen Allen in Johannesburg reports. Many members are said to be livid at the way the matter is being handled, our correspondent says. The "Marikana Massacre" - as it has dubbed by the media - has prompted serious questions about the ANC's ability under Mr Zuma to improve the lives of poor black South Africans. Mr Zuma faces a leadership contest this year, and the fact that so many of the killed miners were from the politically significant Eastern Cape Province could play into the hands of his rivals in an increasingly fragmented party, our correspondent adds. In a blow to the president, the party's largest section in Eastern Cape has just voted for an anti-Zuma candidate as its leader. Mr Zuma earlier expressed sympathy with some of the grievances expressed by the Marikana miners. He argued the mining sector could afford to increase wages and threatened companies that fail to raise workers' housing standards with the cancellation of their mining licences. During a recent visit to the mine, Mr Zuma told workers he "felt their pain" and promised a speedy and thorough investigation of the shootings. Ten people, including two police officers and security guards, were killed during the protests - before the police shooting.